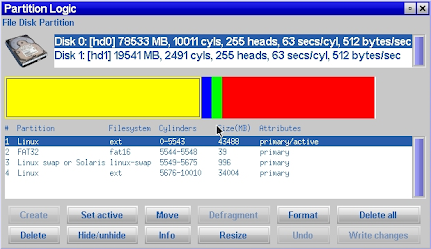 Partition Logic is a free hard disk partition management tool that give user the full control to manage hard disk by creating, deleting, extending and modifying existing partitions. Partition Logic is free software, based on the Visopsys operating system. Partition Logic boots from a CD or floppy disk and runs as a standalone system, independent of your regular operating system. Partition Logic allows user to easily create, delete, format, defragment, resize, and move partitions and modify their attributes. Partition Logic can copy entire hard disks from one to another. Partition Logic is intended to become a free alternative to such commercial programs as Partition Magic, Drive Image, and Norton Ghost. Partition Logic USB version is a bootable USB image file includes a full distribution, and can be written to a (minimum 30MB) USB disk or memory stick, using a program such as Win32 Disk Imager or Image Writer For Windows. Partition Logic ISO image is a bootable ISO CD image file includes the full Partition Logic distribution, ready for burning to CD. ImgBurn is a fantastic Windows utility for burning and ripping CD and DVD images.